The many kinds of Cherry trees and shrubs are favorites in American yards. While some types of these familiar trees are grown primarily for their fruit, many others are valued for their ornamental qualities. Both kinds grace residential lawns and gardens with their lovely spring flowers and attractive shapes. One of the most popular and versatile of the ornamental kinds of cherries is Common Cherrylaurel. Also known as European or English Cherrylaurel, it is a broadleaved evergreen which has many uses in the landscape. The fruit and foliage of this fast growing plant are suspected of being poisonous to animals which may be why it is one of the few landscape shrubs which deer do not eat. Size: Cherry laurels may be in the form of low, compact spreading shrubs, or upright taller shrubs or small trees. As trees, they may grow from 20 to 25 feet tall and 15 to 18 feet wide. However, the shrub forms are more common, growing only 10 to 18 feet tall and spreading as wide as 30 feet if they are not pruned. The variety `Otto Luykens' is very compact, growing to only 5 feet in height and width. Under ideal growing conditions cherry laurels are fast growers. 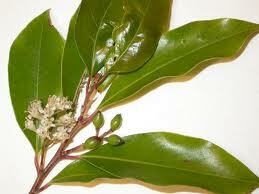 Foliage: Cherry laurel shrubs and trees have evergreen foliage. Individual leaves typically measure from 2 to 6 inches long and from 1/2 to 1 inch wide. They are narrowly oblong in shape with smooth edges that sometimes have a few teeth near the tip of each leaf. Leaves are an attractive glossy dark green above, a paler green underneath. Older leaves turn duller and more olive green as they age. Cherry laurel `Variegata' has mottled leaves of cream and green. Other varieties have narrower, smaller leaves. The undersides of cherryl aurel leaves have distinctive tiny nectar disks about 1/5 inch long near their stem end. 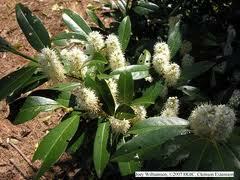 Flowers and Fruit: Cherrylaurel varieties have fragrant white flowers about 1/4 inch long. They develop in narrow, cylindrical clusters from 2 to 5 inches long that emerge where the leaves join the stems. Appearing in late spring, they are followed later in the summer by 1/2 inch long oval green fruits. These drooping fruits that nestle inconspicuously among the foliage eventually turn a purplish-black. They are reputed to be mildly poisonous. There are several excellent varieties of cherrylaurel: `Magnofolia' has very large leaves, can be trained into a tree; `Otto Luyken' is compact with abundant flowers, grows to 4 feet, spreads up to 8 feet; `Schipkaensis' is the hardiest, wide spreading, smaller leaves; `Zabeliana' has narrow, willow type leaves, a good shade ground cover.